Remember the Spy Kids? Well, in case you aren't aware, Alexa PenaVega and Daryl Sabara are still popular as adults, and they should definitely double-date, because fans love them even more as a unit with their significant others. The actress played Carmen Cortez and the actor played her brother Juni Cortez in the four Spy Kids films, the first of which was released in 2001. Back then, Alexa was known as Alexa Vega. The 30-year-old actress took on a combined last name with 29-year-old husband Carlos PenaVega, formerly known as Carlos Pena and who rose to fame his role on the Nickelodeon series Big Time Rush, after they wed in 2014. The two have garnered a large fan following on Instagram, where they often share photos of themselves with their 2-year-old son, Ocean King PenaVega. The PenaVegas are currently expecting their second child. 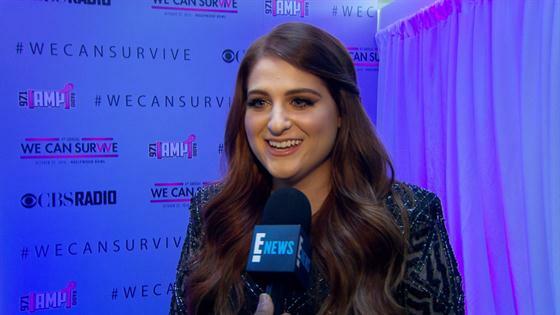 Daryl 26, married singer Meghan Trainor last December, on her 25th birthday, a year after they got engaged and more than two years after they started dating. Remember the Spy Kids? Alexa PenaVega played Carmen Cortez in four Spy Kids movies. And Daryl Sabara played her brother Juni Cortez. Meghan Trainor made her and Daryl Sabara's relationship Instagram official in fall 2016. Daryl Sabara proposed to Meghan Trainor in December 2017 on her 24th birthday, under a tunnel of Christmas lights, after dating for a year and a half. Daryl Sabara married singer Meghan Trainor in front of 100 close friends and family in an intimate backyard ceremony at their L.A. home in December 2018, on her 25th birthday. During their wedding, Daryl Sabara surprised his bride Meghan Trainor with a dance routine to a variety of songs, including Justin Timberlake's "Suit and Tie." Alexa Vega and Carlos Pena got engaged in fall 2013 after dating for about a year. Alexa PenaVega and Carlos PenaVega appear at their wedding in Puerto Vallarta, Mexico in 2014, and combine their last names. The PenaVegas share some exciting news in June 2016. Alexa PenaVega gave birth to her and husband Carlos PenaVega's first child, son Ocean, in December 2016. The PenaVegas share an intimate moment after Alexa gives birth to Ocean. Alexa and Carlos PenaVega announce their happy news, with the help of their son. "We said 'I love you,' like, day six,'" Trainor said on Bailee Madison and Kaitlin Vilasuso's podcast Just Between Us on Thursday. "We were dating for six days and I said, 'You want to go on tour with me?' So we were on tour for our first months of getting to know each other. Being in a hotel, stuck with someone? It was great!" "That's why stuff went fast," she continued. "We were like, Okay, we're living together. This is how we eat food, shower, and live.' Then he said something like, 'I can see a future with you that I couldn't see with other girls when I would date them. I can really see you in my future.' And I was like, 'You wanna marry me?!' and that was days before I wrote 'Marry Me' and then I walked down the aisle to this song." Looking forward to a new generation of Spy Kids, from the OG Spy Kids!